When we bought our holiday cottage we quickly found out that the central heating did not work: it was fine heating the upstairs as long as we did not turn on the pump. As soon as we did, the header tank overflowed and the upstairs radiators filled with air. Downstairs radiators remained cold. After a bit of research we found out that a gravity feed boiler such as a Rayburn needs special plumbing when used with a pumped radiator system. As the previous owner had told us that the Rayburn had been installed by their previous occupant, who had installed it himself, we suspected it had not been plumbed properly. Inspection soon revealed that it had indeed been installed without an injector (or venturi) Tee joint. Furthermore the point where the pumped radiator circuit returned to the gravity feed loop was well away from the boiler and actually fairly near the header tank. 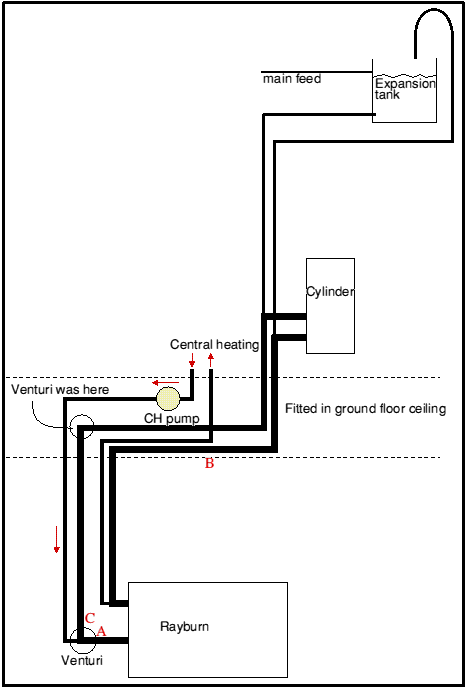 Rayburn's instructions, as well as the instructions for most other gravity-circulation boilers, show the plumbing system. The Venturi action should not need to be strong. It just needs to be enough of a venturi that operating the pump does not over-ride the normal gravity circulation and force water the wrong way round, sucking air down the expansion pipe (as ours did) and filling the radiators with air. Or if the reverse pressure is not that strong, forcing reverse flow through the hot water cylinder and pumping the hot water out of that into the radiators. Excessive venturi action could in fact force water up the expansion pipe into the header tank, circulating water through the tank. Clearly not desirable! Injector T joints are not uncommon on the www - but there are far fewer diagrams of them than there are price, and prices vary from about £15 to over £50. There's nothing magical about a venturi, so I visited PTS, our local plumber's merchant and after a helpful chat, bought a few bits. Photo 3 shows the venturi in place in the tee junction. The two drawings below show the parts used to make the injector tee and, below, how the injector Tee combines pumped radiator circulation with the gravity feed hot water circulation. I pre-soldered the 15mm nozzle into the reducer. It doesn't need to be a water-tight joint as it's for fluidic effect. My venturi is going to be horizontal so even if the solder re-melted it should be no problem. If I were going to mount it vertically I should have used a centre-punch and a suitable mandrel to make a mechanically sound joint first. The assembled nozzle is held in place by the positioning stop inside the T joint and the 22mm pipe from the radiators. It will probably get soldered when assembling the whole, but it does not matter whether it's soldered or not. Thursday the 1st of September, 2011. The plumbing eventually got sorted. The layout of the system is as the diagram right. There was indeed an injector tee but it was fitted in the ceiling, so about 6 feet above the Rayburn. I moved it rather that fit the one described above. The nozzle of the official Tee is a little smaller than the internal diameter of the 15mm pipe I used. I also found that the central heating pump was set to maximum - not a good idea. The heating now works, but is not quite ideal: the central heating take off point should be as close as possible to the Rayburn. It is a good distance from the Rayburn (at point B on the diagram) and pipe resistance will still tend to favour some back flow through the cylinde - especially is the pump is turned too highr. The horizontal pipes in the ceiling are also not ideal for gravity circulation. It has been suggested that an improvement may be made by using a longer length of thin pipe to put the venturi further away from the bend. A venturi operates by virtue of the fact that the pressure in a moving fluid is lower than that in still liquid. The faster the movement, the lower the pressure. A bend just before the venturi would cause vortices which themselves are areas of reduced pressure. At a distance from the bend, flow would be more laminar.